This is a complete AppleHDA patching guide for the Audio codec in the Notebooks (but theory works for Desktop too). I'm writing this guide based on my knowledge and experience gained myself doing so many patches and details from the web. Hoping this could help many people looking to patch their AppleHDA by themselves. I did my best to make this as simple as possible and will try to improve as the time passes. Also I don't take credit for all this information entirely except for appreciation on writing this guide. The credit will go for all these people: king, Master Chief, RevoGirl, toleda, bcc9, TimeWalker and many others who contributed to AppleHDA patching. I'm using the Audio codec ALC269 and HD3000 HDMI audio which i've in my notebook for explaining the process. And I'm gonna break this guide into four chapters since its gonna be a very lengthy guide because of trying to provide insight on everything. Hope everyone can find this easy and helpful. Lets get started! 2. Patching XML(Platforms and layout) files. First, we need get the dump of your audio codec from linux. So, get into any of the Linux distributions of either Live USB/CD (or) Full install. And enter the following command in terminal to get the dump in text format at Desktop. We have analyzed and got the relevant details from the codec dump in part 1. Now, we try to get the values of Pin Default, EAPD and Node ID from the Pin Complex nodes with Control Name extracted above. We will get the verb data from the Pin Default values of Nodes. Pin default values must be read from right to left. And we will take two digits from it and write it down from left to right like below explained for ALC269. Extracted verb data: "10 01 13 99"
Extracted verb data: "20 18 a1 04"
Extracted verb data: "2f 09 a3 99"
Extracted verb data: "1f 10 21 04"
Now, we need to correct the above verb data according to verbs info explained in the second post. Apple uses the location value as Built in Device - N/A instead of ATAPi in their codecs, which is always '0 ' for the location bit for the Integrated devices(Speakr, Int Mic). This is optional and audio will work if we use default codec value also. Just changing this to be more like Apple codec so we can avoid any future issues. For internal devices like speakers etc., we use the jack color value as '0'(unknown) and need to Jack sense value of '1'. For external devices like Headphones etc., we use the jack color value as '1'(black) and need to Jack sense value of '0'. In this jack color may be optional, but Jack sense must use the values i've explained. We have to set this value to '0' for every device because Apple don't use analog multi out. We have corrected above 2f and 1f values to 20 and 10 by replacing f with 0 in our example, so this Sequence number(Second digit) value must be always 0 for every node and A is the associate bit value of the node which is unique for each node. The Default association bit in the codec verbs must not match with other devices, so the association bit must be unique for all the devices. Here, We have same association bit for both Speakers and Headphone as "1" and for both Mic's as "2", so we have to correct this default association bit. Most importantly the association bit must be in sequence and serially like assigning 1,2...x to the Nodes in sequence. For example:- '1' to node 14, '2' to node 18 in sequence, '3' to Node 19 in sequence and '4' to Node 21 in sequence to previous node 19. The association bit value can either 1 2 3â€¦.. d.e.f. We have to look carefully at the output nodes like Speaker and Headphone, since in some codecs there is an External Amplifier(EAPD) to power up/down the Speaker to save power. We need to use EAPD command to wake up the node to get the sound otherwise we won't get sound even though its recognized. If you did not get the "Ambient noise reduction" working for the Internal mic then you have to correct the "Connection type" bit field to Unknown Code Value(i.e, 0). In our example, we have the value 'a3' for the mic and corrected to 'a0'. Here, we have to correct the external mic verb data to LineIn, otherwise the external mic won't work with AppleHDA.So, the verb data needs to be corrected at the position where it tells what kind of device it is. Existing verb data for External Mic is "ax", where 'a' tells its Mic In. Now, we change this to Line in with 'ax' is replaced by '81' . For more information about the codec verbs info:Click Here. We have the Codec Address value from the Section 2 of Part 1. We have the NodeID's values from the above Section 1 of Part 2. We have the verb data from the Section 2 of Part 2. In our ALC269 example, there is an EAPD at Node 14 of Speaker. So, we need to calculate the verb command for this EAPD and use in our patch to get sound from speaker. Now, we assemble the calculated codec verb commands so we can use for AppleHDA patch. We should disable the nodes that the codec is not using, so we can avoid any issues from them. Use the following the verb data for disabling those nodes and calculate verb commands. For calculating the PathMaps, we have to carefully follow the connections mentioned in every node from the analyzed relevant nodes information in the Section 2 of Part 1. We have to find a Pin Complex node, an Audio Mixer node (optional for some codecs) and finally an Audio output node. We have to find a Pin Complex node, an Audio Mixer/Selector node (optional for some codecs) and finally an Audio input node. Lets first calculate the PathMaps for the output devices speaker and Headphone in our example ALC269. According to the output device PathMap pattern, first we need to find Pin Complex node. In our ALC269 example, the output device 'Speaker' is located at the Pin Complex Node 0x14 with the Control Name "Speaker Playback Switch". Write down this Pin Complex node value in hex and decimal value. Now, take a look at the Connection in the Node 0x14. Again, take a look at the node 0x0c we reached from the node 0x14. Here, we have two more nodes 0x02 and 0x0b without asterisk symbol(*) indicating the path where it goes. So, we have to figure out ourself and choose one from the two nodes. To solve this, just take a look at the two Nodes 0x02 and 0x0b. Now, we have calculated PathMap for the output device speaker. Now, we have calculated PathMap for the output device Headphone. If both Pin Complex nodes have connection to same Audio output node then try to use the other output node we analyzed from codec dump and test. sometimes using same output node for both also works. Calculating the pathMaps for input devices is little different from the output devices because connections are not mentioned and doesn't follow similar to output nodes. So, in this case we have go through the PathMap pattern from "Audio input" to "Pin Complex node" instead from "Pin Complex node" to "Audio Input" like we did for Output devices. First go to the Audio input node and look at the connections to the nodes Audio Mixer/Selector from here. If it contains the symbol "*" then that is the Pin Complex node it is connected to, so got the PathMap of Pin Comple Node->Audio Mixer/Selector->Audio Input we needed. If it does not contain then compare the results of the other Audio Input node ->Audio Mixers/Selector for the symbol "*". Even that Audio Mixer/Selector node also don't has symbol "*" then try to experiment with the available options of Pin complex node to Audio Selector/Mixer nodes (or) look at the Pin Complex node connections to Audio Selector/Mixer nodes. Lets calculate the PathMaps for the example of ALC 269. I've followed the Audio input (Node#9) Connection to Audio Selector(Node#22) then to Audio Input (Node#18) because of the symbol "*" on that node indicating default path. Again, followed Audio input (Node#8) Connections to Audio Mixer(Node#23). But, i did not find the symbol "*" here to show the path. However, i've followed to Pin complex (Node#19) because its the only Input device we left with and even the connections of the Node#22 contains a Connection to Node#19 as well. After following all the above steps, we get the verb commands and PathMaps for the codec. Hoping this could help some people in patching their AppleHDA. From 10.8 or later, the xml files are compressed to zlib format. We have to uncompress them to edit the files. After editing, again we have to compress it back to zlib. You can either use the attached xml files (or) can choose any one of the layout xml file from the apple Resources directory inside AppleHDA kext that matches Inputs and outputs of your codec and try this only if you want to experiment. I'm using the Layout28.xml of Apple and edited to the values of ALC269. One of the reason to choose layout28 is because its used in MacBookPro8,1 and works very well. The other layout id's which also works for some codecs are '1' and '12' in hackintosh. Note: We removed the tags External Mic, SPDIF from the Apple layout28 xml file since they are not needed for our example ALC269. In the Layout xml file, we have to edit the following information. 4. Edit the "IntSpeaker" key like below and remove all the signal processing elements. 5. Edit the "LineIn" key like below. 6. Edit the "Mic" key like below. 8. Edit the PathMapID tag at the end of the file with the PathMapID value used in Platforms xml file. Note: SignalProcessing elements for Mic and Speaker are not supported by some codecs, so i've removed it. 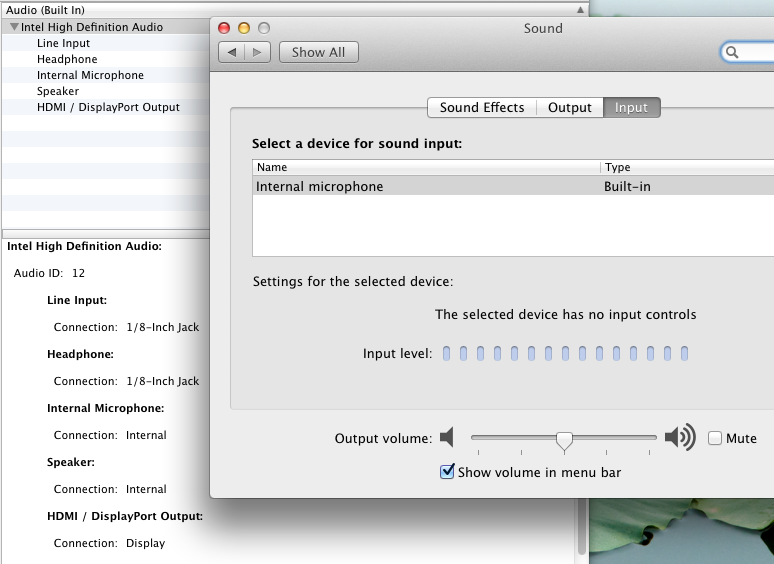 But can provide some good audio if used but not sure, so try to experiment with this later after getting audio working. I've attached xml files with the SignalProcessing working fine in ALC269 for speaker and Mic in Realtek and IDT for your reference, you can get more from Apple xml files. This file contains the Mapping of Controls to its nodes giving a path. These path maps are contained in the key tag "PathMaps". Note:You can use the Platforms xml file i've attached which has all the PathMaps of Apple codec are removed and has only one PathMap of ALC269 in order to make it easy for editing instead of Apple file. We need to add our pathMaps to this root key which is a mapping of our Pin Complex's(O/P & I/P) to its Output/Input controls. Follow the pattern i've explained below and edit the values of your codec nodes PathMaps calculated in the first post for each input and output. After editing then add the PathMap pattern of yours inside the file Platforms.xml at the end after the key tag of PathMapID like below. Note: Some codecs doesn't need (or) use Audio Mixer/Selector node, so in order to get them working we should remove it from the pattern. Mostly this has been seen from IDT and Conexant codecs so far by me. Note: Some codecs doesn't need (or) use Audio Mixer, so in order to get them working we should remove it from the pattern. Mostly this has been seen from IDT and Conexant codecs so far by me. Values: Always set this to '0' because Apple dont use analog multi outputs in their codec. X = Port Connectivity - indicates the external connectivity of the Pin Complex. Software can use this value to know what Pin Complexes are connected to jacks, internal devices, or not connected at all. 00b - The Port Complex is connected to a jack (1/8, ATAPI, etc.). 11b - Both a jack and an internal device are attached. Location indicates the physical location of the jack or device to which the pin complex is connected. This allows software to indicate, for instance, that the device is the â€œFront Panel Headphone Jackâ€ as opposed to rear panel connections. Pad the front with zeros to make it 8 dgits. Hi EmlyDinesh, Can you help me to fix me Mic? Actually I am facing difficulty to fix the pathmaps of mic. Ok, let you know after I gone through your dump today to tomorrow. I am expecting you . Sorry for the delay I forgot. Actually I am fighting to make my mic active for a long time. Different view, different way. Failed !!! It always in a ideal position - "The selected device has no input controls". Also tried with your path map same result . If you have time please have a look on my audio kext Audio kext.zip , I will greatly appreciate you. Here is modified kext, try this and let me know. Thanks for your interest bro. I have checked your modified kext, no difference as previous-"The selected device has no input controls" . Devices known as like the previous picture.